Basement Finishing requires vision, experience, and attention to detail and that’s what you’ll get with “Team Holp” at Holp Construction & Design. We have been remodeling basements for almost 20 years and understand how layout is vital to maximizing your space. Our team can relocate plumbing for bathrooms, add egress windows to create an up to code bedroom, and disguise unsightly ducts in your ceiling. We have a full team of skilled trades that help us with electrical, plumbing, HVAC, drywall, painting, tile, flooring and design. 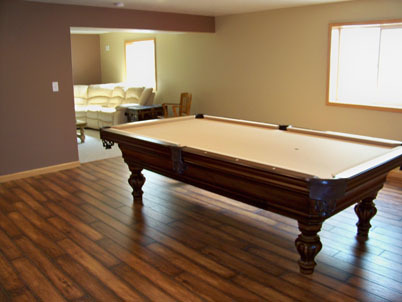 The first step is to develop an idea of what you want for your finished basement. Start with a prioritized list of your needs and wants. Collect pictures from magazines and websites to help you create a vision of what elements you like about a finished basement. The more clearly you can envision your finished basement layout the better prepared you’ll be in making your decisions. Do you want to add bedrooms, bathrooms, a family or game room, wet bars, new flooring, choose paint colors, and lighting fixtures. Try to imagine how you will utilize your new basement space..
You may want to improve your homes efficiency by replacing windows and doors, upgrading heating and cooling systems, adding insulation, and egress windows to make the home more energy-efficient, easier to maintain for maximum comfort. Going online to investigate national remodeling cost averages to get a realistic idea of what your basement finishing project may cost. 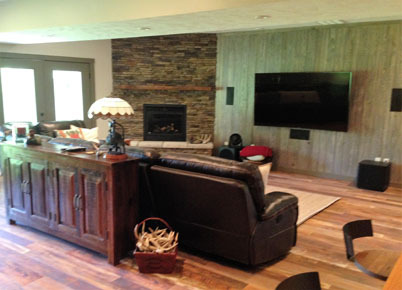 This is something we will discuss as we look at your needs and wants for your basement remodel. This is called budget qualifying. Budget qualifying will help us both know if we should continue forward with the estimate/bid stage or if additional time is needed to work towards your remodeling goals.